When a cave forms in a headland it may erode right through and emerge on the other side. This forms an arch-shaped feature, predictably called a sea arch, or just an ‘arch’. As the cave grows in size the arch becomes more obvious and impressive, often looking like a doorway through the headland. Eventually the arch won’t be able to support itself, the top of the arch will collapse, and the seaward end will be seperated from the mainland to form a stack. 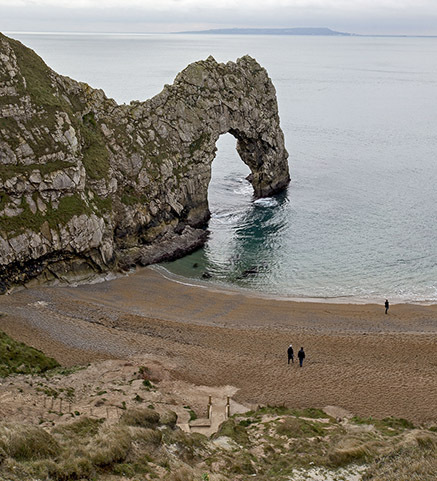 Durdle Door, in Dorset, is one of the UK’s best known sea arches. It is formed from a resistant band of limestone known as Portland Freestone, with the top of the arch formed from another limestone known as Purbeck limestone. These rocks are much harder that the Wealden clays and sandstones that lie behind it, so erosion has removed the softer rocks and left the narrow band of limestone with it’s famous arch. The bedding in the limestone has been folded through 90 degrees, so it is vertical rather than horizontal, meaning that the arch would have started as a typical sea cave exploiting a vertical crack in the rock face. Durdle Door is a very popular tourist attraction, bringing thousands of people to the area every week during the summer. 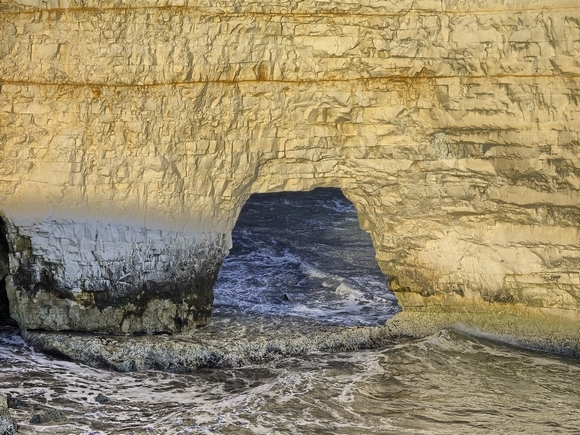 Another famous arch can be found at Old Harry Rocks, near Studland in Dorset. Old Harry itself is a large stack that, 250 years ago in the 1770’s, was still attached to the headland via an arch. The arch was strong enough that people would walk right out to the end of Old Harry to admire the view. That arch collapsed long ago, turning Old Harry into a stack, but newer arches are still being formed. Several small caves extend right through the headland and through the base of the large stack, showing arches in their early development. The photograph shows a relatively new arch formed by a cave extending right through the base of the stack. The horizontal bedding of the chalk makes the roof of the arch weak and results in upward growth of the arch.